a wide-ranging anti-corruption initiative, according to local reports, according to CNBC. Al-Waleed Bin Talal bin Abdulaziz al Saud (Arabic: الوليد بن طلال بن عبدالعزيز آل سعود‎‎, is a grandson of Ibn Saud, the first Saudi king, a half-nephew of all Saudi kings since. He is the founder, chief executive officer and 95-percent owner of the Kingdom Holding Company, which has major positions in Apple, Twitter, Lyft and is Citigroup's largest individual shareholder. Al-Waleed is also the second-largest voting shareholder in 21st Century Fox, and owns Paris' Four Seasons Hotel George V and part of the Plaza Hotel. 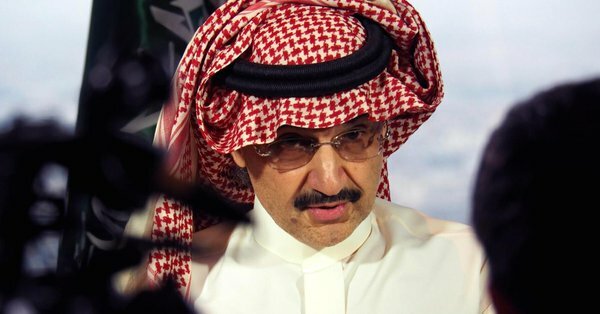 Time has called him the "Arabian Warren Buffett".In March 2016 Forbes listed Al-Waleed as the 41st richest man in the world, with an estimated net worth of $17.3 billion. The Saudi-owned Al-Arabiya news channel also reported late Saturday that dozens of princes and former ministers were detained in a new anti-corruption probe. Also, the king ousted one of the country's highest-level royals from power, relieving Prince Miteb bin Abdullah of his post as head of the National Guard. Prince Miteb was once considered a contender for the throne. The monarch also replaced Minister of Economy and Planning Adel Fakeih. Note doubt this is the work of Crown Prince Mohammed Salman, who is first in line to succeed King Salman to the throne. The Crown Prince is the cousin of Al-Waleed. I have not covered the Crown Prince in EPJ but I have in the EPJ Daily Alert given his importance to the oil markets. And now we have the Crown Prince arresting his very powerful cousin. That is, the ruthless, reckless Crown Prince has just increased tensions on an international level. Al-Waleed has very powerful friends in the west. Very powerful. This is going to get very interesting. It should also be noted that the Crown Prince appears to get along with President Trump while Al-Waleed has posted some negative tweets about Trump. During the presidential election campaign, there was even a back and forth twitter battle between Trump and Al-Waleed. Curiously, Trump tweeted this out just hours before the arrest of Al-Waleed. Looks like Trump is all in with the reckless one. Trump called the Saudi King in a show of support on the day of Saudi purge. Saudi prince Abdel Aziz Fahd (son of late King Fahd) is dead. Possibly killed in firefight as security forces tried to arrest him. LOVE seeing WEASEL KILLER Al-Waleed PINCHED! Hopefully he is extradited to U.S. and charged with orchestrating 9/11! Then he can RAT OUT the Bushes and other in U.S. personnel involved or complicit. Doubt he'd make here alive. Love to get a honest answer from Giuliani about why he told Al-Waleed to take his multi million dollar check and SHOVE IT where the sun doesn't shine!